PennsylvAsia: Free performance by Taiwan Acrobatic Troupe, September 28 at Carlow University. 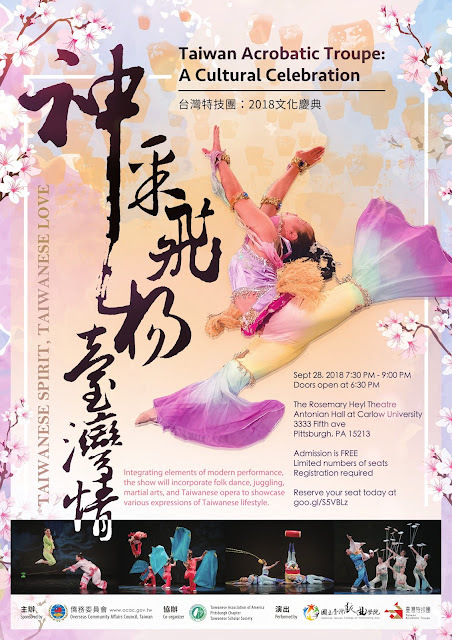 Free performance by Taiwan Acrobatic Troupe, September 28 at Carlow University. The Troupe of Acrobats at National Taiwan College of Performing Art will give a free performance, titled Taiwan Acrobatic Troupe: A Cultural Celebration, on September 28 at Carlow University. The inspiration of the performance is founded on Taiwan's diverse heritage. Integrating elements of modern performance, the show will also incorporate folk dance, juggling, martial arts, and Taiwanese opera to showcase various expressions of Taiwanese lifestyle. The audience can look forward to this interactive performance! The show runs from 7:30 to 9:00 pm at the Rosemary Heyle Theater in Antonian Hall at Carlow University in Oakland (map). The performance is free but advanced registration is required and can be completed online.